Any Republican who claims the party’s presidential nominating contest has improved its chances of unseating Barack Obama is either self-delusional or engaging in transparently disingenuous spin. The poisonous effects of the process were the talk of the political world on Monday, thanks to a startling NBC News/Wall Street Journal poll that found Mitt Romney’s image to be in a state of disrepair, with just 28 percent of general election voters expressing a positive view of him and 39 percent a negative one. Ah, there it is: the silver lining for dejected Republicans – and the definitive cautionary tale for any Democrat tempted to pop the champagne cork. It can be hard to appreciate now with Clinton’s reputation as a peerless political talent secure for generations to come, but 20 years ago at roughly this same moment, it was common wisdom that his nomination would be a disaster for the Democratic Party. Clinton had emerged in late 1991 as the Democratic front-runner only after the party’s entire A-list roster passed on the race. Shortly thereafter, he was rocked by a string of scandals (Gennifer Flowers, the Vietnam draft) that drove up his negative ratings and convinced most observers that he’d made an easy mark for George H.W. Bush and his attack machine. Thanks to the lack of a broadly acceptable alternative – after Bob Kerrey failed to ignite, Clinton’s two chief opponents became Paul Tsongas and Jerry Brown – Clinton emerged as the Democratic nominee anyway, but only after a bumpy process marked by limited voter enthusiasm and loud calls for a white knight candidate. So unpopular was Clinton that he soon fell to third place in general election trial heats, trailing not just Bush but also Ross Perot, whose independent candidacy initially satisfied the demands of anti-Bush voters who saw Clinton as unacceptable. The economy was in rough shape and Bush’s popularity was perilously low, but the smart money in the spring of ’92 was on him winning reelection anyway, due mainly to the Democrats’ self-destruction. To most Americans, it seemed that a bad situation was getting worse, and Bush’s pleas that the country was turning a corner fell flatter than ever. The recovery is tenuous enough now that a similar burst of bad news in the middle of 2012 is very possible – meaning it’s possible that Romney, for all his woes now, could find himself delivering a convention speech of his own just as swing voters are ready to give an Obama alternative a fresh look. At the same time, there are some major differences between Clinton’s ’92 story and the current situation. For one, Bush was in far worse shape now than Obama is. A CBS/New York Times poll in April ’92, when Clinton pulled away from his Democratic competitors once and for all, gave Bush an approval rating of just 39 percent. Obama’s in the new NBC/WSJ survey is 50 percent. Plus, Obama is more personally popular than Bush was. NBC/WSJ shows that 49 percent of voters view him positively; only 35 percent said the same about Bush in that April ’92 poll. Moreover, Obama is now presiding over an improving economy. The jobless rate has fallen for five consecutive months and now sits at its lowest level since his first full month in office. And there’s been other good news lately, from big stock market gains to surprising profits from a revived auto industry. 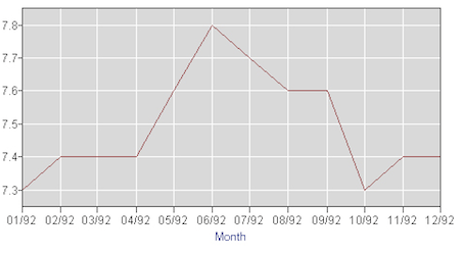 The good news has clearly rubbed off on Obama, whose job approval rating has risen as the jobless rate has fallen. In ’92, the economy didn’t show any real life until the final weeks of the campaign, when it was too late to do Bush any good. But the biggest difference may have to do with brand poisoning. At the outset of this race, the promise for Republicans of Romney’s campaign was that he’d serve as a generic nominee – an inoffensive, competent-seeming candidate who wouldn’t scare off swing voters looking for an Obama alternative. But over the past year, thanks to the antics of the Tea Party, the Republican-led House, and a host of unpopular governors, the GOP’s image has crashed. The party is now saddled with a net negative rating of minus-11 points, according to the NBC/WSJ poll, with Democrats at plus-two. The GOP hasn’t been this reviled since the Clinton impeachment saga. This creates a serious problem for Romney, who as the nominee could find it a struggle to separate himself from his party’s poisonous image. Democrats in ’92, were coming off of three consecutive landslide national defeats, so Clinton did have some brand poisoning to contend with, but it wasn’t anywhere near as significant as this. Plus, Republicans had owned the White House for 12 years at that point, so when Bush warned of handing back power to the party of Jimmy Carter, he was making a very dated reference. Not so for any Obama references this year to George W. Bush. So while it is possible that Republicans will end up writing their own version of the Clinton story this year, it’s clear that they’re going to need some seriously bad economic news this spring and summer – a lot of it.